A lusciously thick, one-pot dal, this family favourite is cooked in under 30 minutes with heaps of healthy vegetables like broccoli, cauliflower, carrots, beans, peas and tomatoes. Spring has sprung and with it a number of regional New Years have also been celebrated in India – Poila Boisakh in Bengal, Vishu in Kerala, Rongali Bihu in Assam and Puthaandu in Tamil Nadu. This dal steeped in goodness is just what the doctor ordered after celebratory feasts and Easter chocolates! Interestingly, this dal does not need a separate tadka or spice tempering. It gets its bowlfuls of flavour from the fresh vegetables cooked in it and the sprinkling of garam masala, chilli powder or flakes and fresh coriander at the end. I love dotting this with ghee and squirting some lemon on it before tucking in with rotis, but I can tell you that this one-pot vegetable dal just as good with soft steamed rice and crispy papad. In a large pot, wash the lentils thoroughly in a sieve until the water runs clean underneath. Fill the pot half way with clean water and bring the lentils to boil over a high flame. Finely mince the ginger and garlic. In about 10 minutes, the lentils will start losing their shape and combining with the water. Now add the ginger, garlic, turmeric and bay leaf. Continue cooking for 10 minutes until you can’t smell the raw ginger and garlic. The water in the pot will start drying up, add water a cup at a time when it does. While the dal is bubbling, roughly chop the tomato and onion. Next, chuck in the tomato, onion and all the vegetables adding them in order of how long they will take to cook. Keep cooking the dal on high for another 10 minutes until the vegetables are soft. 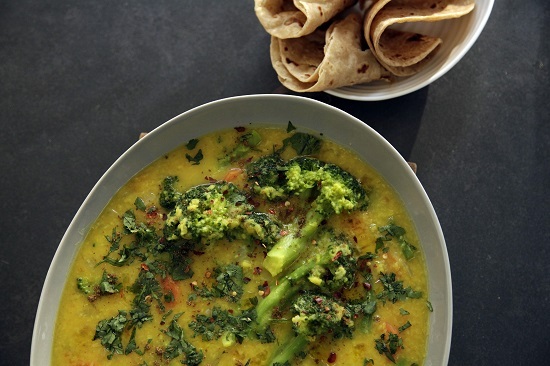 By this time, your one-pot vegetable dal will have a thick and smooth soup-like consistency. To finish, stir in the lemon juice, garam masala, chilli flakes and fresh coriander. Right up my street, yum. Thank you. Thank You For Sharing Vegetable Dal Recipe Tips.. Happy New Year and lovely to see a recipe from you will make it it his weekend. I wonder how some proseco would taste.with this yummy vegetable dal???????? Are there plans for the recipes to be able to be pinned on pinterest? I made this last night and it was very tasty and so easy. My husband didn’t complain that there was no meat so it must be good! Thank you, a nice easy mid week meal. Thanks for sharing this recipe, it will be useful and very easy for working moms. Awesome recipe for chapathi, Thanks for sharing. This is a lovely dish. I will ask my soon to be spouse to prepare this dish for me. Looks delicious as well as healthy. Everything looks good, except lemon. I think it can sometimes distort the flavour. But anways lovely dish all the way. Making this tonight thank you 🙂 Question – I love in Spain and I don’t think I can find yellow moong Dahl in the village I love in – would it be alright to use regular lentils? Or would that greatly change flavour? Thank you! Looks yumm, loved it. Thanks for sharing this recipe.